Writer/director Daniel Fitsimmons discusses his British sci-fi drama. The title Native seems to refer to the idea of acquiring the customs of a foreign culture when one is cut off from what is familiar, or from one’s own home - what attracted you to this subject? Yes, that's a good way of putting it. It certainly rings true with some of the things that the characters go through in the film. The etymology of the word 'native' refers to birth, the idea of being born. And today it infers a certain loyalty or pride in the place or group into which you are born, so it felt right for the kind of story we wanted to tell. Consciously I was drawn to the story because it was a type of streamlined science fiction that I thought would be interesting to explore, but subconsciously maybe the fact that I have lived in loads of different places since I was about 13 made me empathise in a very profound way with the characters of Cane and Eva: Two people on a mission struggling for a sense of identity as all their recognisable points of context are stripped away. Was it a natural decision to set the story in the sci-fi genre? Absolutely. Sci-fi, by necessity, forces a filmmaker to design a large part of the film's landscape from scratch. And the fact that our story is a literal journey meant that a spaceship of discovery was the logical place to put the characters. The initial idea, which came from the twin paradox thought experiment, was grounded in theoretical physics. Then by bending the rules to suit, we naturally ended up turning science fact into fiction in order to tell the story. The question of the destination was the last one we answered when it came to writing the movie, but in hindsight the choice of destination could only have ever worked in the way that it does. How did the story first come into being? What were your inspirations? I was influenced by writers like Stanisław Lem and Jorge Luis Borges, and was reading a lot about North Korea, becoming fascinated by people living in a bubble; that indoctrinated outlook rendering people unable to see things from any other perspective than the one that echoes their own predisposed conditioning. The Robert A. Heinlein novel, Time For The Stars, kind of kicked me into the story we tell in Native. I suppose to some extent the story is my reaction against the suffocating, colonising and invasive use of social media in almost every aspect of the way people conduct their lives. 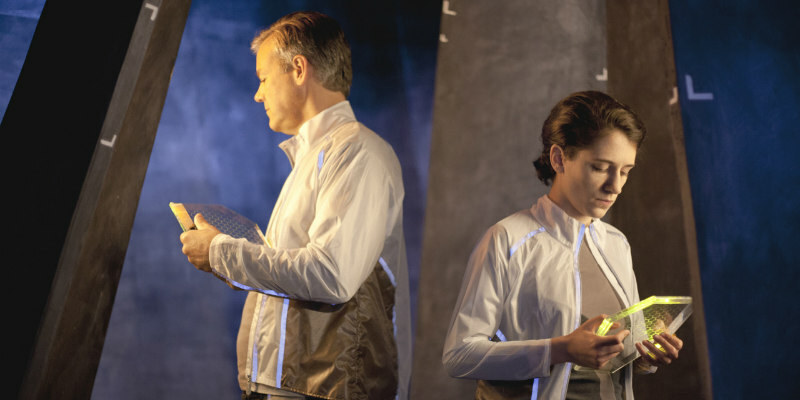 In Native, Cane and Eva, and their society, can connect telepathically. Is that a good thing? People will have to watch the film to make their own mind up on that one! By calling the alien collective ‘The Hive’ and building the ship and their home architecture almost entirely out of hexagonal shapes, was this purposefully meant to evoke a beehive or wasps' nest? Indeed. Bees do actually usurp other hives as well, and as our characters are highly intelligent and loyal, I liked the parallel. I also wanted the ship to interconnect in a warren-like structure so that we could make it feel expansive or claustrophobic as the story's requirements demanded. The hexagon shape lent itself well to what we wanted to do practically and thematically. In some ways the constraints of the budget are advantageous, as it encourages the viewer to engage with the story and characters rather than be distracted by the setting - but how did you overcome the budget restrictions when it came to your ‘world-building’? You have to embrace the 'less is more' ethos in almost every aspect of the process. Do less, but say more in every choice that you make. That is where it becomes liberating, when you have to think yourself out of a problem rather than spend your way out. That's not to say that more money wouldn't have resulted in a different film, but who knows what that hypothetical film would have been? The key is to make peace with what you have on the page, put faith in the team you are working with, and commit to all of it 100%. Audiences are clever, and humans have communicated through story for thousands of years. I think we can tell by instinct when the filmmaker or storyteller doesn't quite believe in the thing they are trying telling you. You attracted two excellent character actors to play the main protagonists - how did you go about persuading them to join your debut feature? I think both Rupert Graves and Ellie Kendrick connected with the script quickly, so that when we met to talk about my plans for the film the conversation came round to 'when', not 'if' we would work together on this pretty soon. I have to say they took a big gamble on me, because if sci-fi goes wrong it can go very wrong - and the actors are the most exposed in that scenario. But I'm glad to say they placed their trust in me to do justice to that screenplay. Things moved very quickly from there. We had one day of rehearsals the three of us together, and then we were straight into it a week or so later. No messing about. What do you think indie sci-fi movies have to offer audiences that the mainstream does not? Ideas, originality. The cost discrepancy between blockbuster sci-fi and indie sci-fi is massive. Maybe bigger than it has ever been. So at the indie level, it is possible to take greater risks. If those risks pay off, maybe the audiences get bigger rewards. I would much rather watch a film that is bold in its ambition than a film that feels like it has one eye on the opening weekend box office. 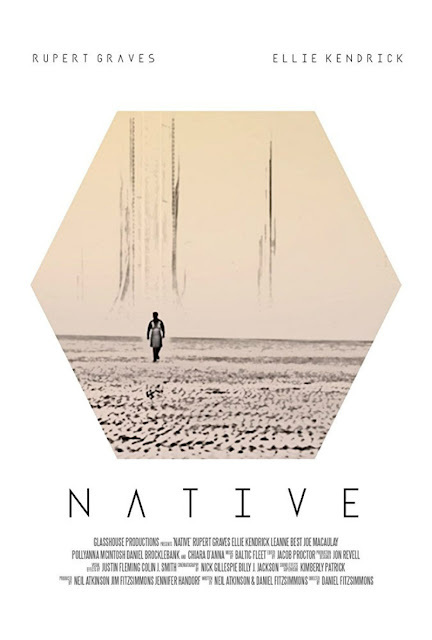 Native was first screened at the Boston Sci-Fi Film Festival (where I believe it won best feature award) and the East End Film Festival, in 2016, but it’s not got to UK screens until now - why the delay? It's been a long road. I won Best New Filmmaker in Boston, and Neil Atkinson and I were nominated for the Screenwriting Award at EEFF and then last year we had some issues to sort out with sales agents and distributors. Happily, that's all worked itself out now, and people can actually get to see the film, which is the most pleasing part of the whole process. Native is in UK cinemas February 23rd. Read our review.